Korean companies as none other can surprise customers by occasionally announcing their new but virtually unheard-of models. This is the way the new LG G7120 phone appeared, though it is, in fact, a redesign of the well-known G7100 model. G7100 is probably one of the most successful LG products of the last year. A lot of money were invested in its promotion, which resulted in its wide renown. The phone's draft design might seem somewhat awkward as it combines "feminine" features (smooth forms, a large glassy "illuminator") with a men's size. However, G7100 advantages got better, and the phone stood out against its analogs, such as Samsung V200 and P400. It has become popular with "stylish" customers that never use their phones long, seeking to try all new top-class models. It was obvious that a redesign would try to make up for the above-mentioned inconsistency. But along with that, there was a high risk of trivializing the model. LG designers were successful enough to avoid it: though G7120 looks very much different from G7100, it is still something special. LG G7120 is a clamshell phone, a bit more than middle-sized, and practically identical to G7100 in weight/size parameters. G7120 has a feature common for many LG clamshells  a thin base unit which makes an unfolded handset look more elegant and thin. However, the model doesn't look thin when folded, due to a rather thick cover. G7120 futuristic design saved it from becoming a trivial "average" clamshell. Its clear-cut hinge with glassy cover-plates and a large dark mirror plate over the external OLED-display make the phone look like a sci-fi gadget. Its design, catering to young people with technocratic tastes, forms, in fact, the phone's stable target-group. The model is made of high-quality plastic, similar to that used in the best image phones. The hinge is solid and turns with no backlash. It means that the phone won't squeak at opening and the cover won't loosen broadwise. Like its G7100 predecessor, this model has a swivelling cover that can rotate to 90° clockwise and 180° anti-clockwise. The cover can even be "turned inside out" so that the main screen will be on the outside. And one can turn the cover at any opening angle. The rotating mechanism is also solid, has no backlash and seems quite reliable. G7120 is equipped with a VGA-camera, adjusted to the hinge so that the objective's optic axis coincides with that of the hinge (the same as in G7100). The base unit's right side has a for camera controls, and an IR-port. Two buttons on the left side are for volume settings and menu scrolling. The keys are acute-angled and look as if continuing the handset's lines. They are easily pressed with a soft touch, although it often causes unintentional pressings when somebody takes the phone. The G7120 main keypad, apart from a standard base unit, also includes two soft keys, call, off and cancel buttons, and a 4-way joystick with an embedded confirmation key that is also a hot key for WAP-browser in waiting mode. 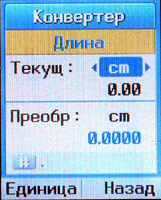 The central row of numeric keys is made a bit sunk to facilitate finding keys by touch (same as in Motorola v500). In general, there are no claims about the keys, but joystick is another thing. First of all, it is hard to discern by touch. Each of its sides borders on another pressable surface, but the joystick doesn't jut out  which will certainly cause many unintentional pressings. The embedded key has similar problems, but at least it does jut out. And besides, it's made of plastic which is easily discernible agains metallic surface around. G7120 display is made using the UFB technology (STN with a higher brightness) and supports 65,535 colours. Compared to TFT-displays, its colours are not so rich and bright. Of course, you can reach a good image quality by changing some settings, but in general, the display is clearly inferior to the TFT ones. It's obvious that main displays on LG's top-class phones need updating. UFB-displays may be good enough for middle-class phones but surely not for expensive models. 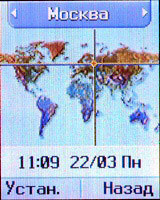 The outer OLED-display supports 256 colours. When in stand-by mode, it merges with a mirror-like cover plate; when activated, a colour image appears under the plate. This spectacular feature seems to be gaining ground: the new Philips image clamshell looks similar, except that the display is monochrome. Unfortunately, the G7120 display is not active by default and it deprives the phone of certain charm. The handset looks much better with the display on. Images in the outer display can be changed with the lower side button. You can choose a static image with time, date, an animated picture, or stand-by mode. The image looks impressive in a dark room, it is bright and contrast (due to an almost pitch-black background). In the sun, the image is far less discernible. And we deem it appropriate here to dispel the widespread myth that OLED-displays look allegedly better in a bright sunlight than STNs and even TFTs. In reality, a display's legibility in the sun depends not on its contrast, but on the absolute value of its elements' brightness (exitance). 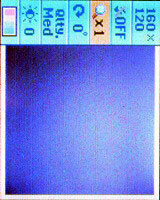 This value is relatively low in an OLED, and a high brightness is achieved due to a high contrast. A display's legibility in external lighting depends on the ratio between the intensiveness of the luminous flux emitted by the display and the intensiveness of the light reflected from its surface. The brighter the display, the higher the ratio. For the present moment, TFT-displays have the highest brightness of all, that is why they look better than any other display in the sun. If an outer display has a mirror-like surface, it reflects more sunlight and only makes the case worse. G7120 is supplied with a Li-Ion battery that also serves as a back panel. It fixes with two hooks at the bottom and a clip at the top. The bracing is tight enough, and besides, the battery's upper part has a rubber cover-piece which makes it even tighter. So, there is no backlash in this bracing and it's unlikely to appear with time. The SIM-card slot is very simple, it is fitted with a pair of fixed clamping straps at the sides. In terms of functionality, G7120 is similar to G7100, so a brief description of its menu will be enough. 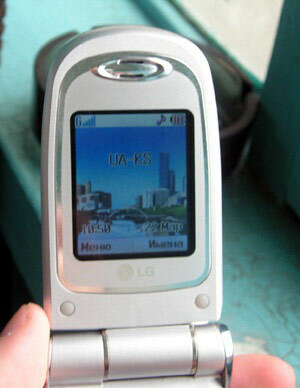 The vertically scrolled menu is traditional for LG models. 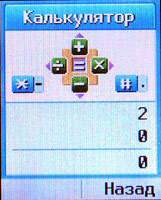 The position of a selected item is shown in the column of icons on the right. 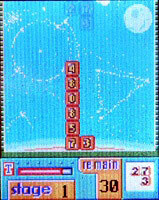 The menu is activated with the left soft key and is further navigated with the joystick. You can either press a soft key or the OK key for confirmation. The C key  as well as the other soft key sometimes  is used for cancelling. You can also use one of the soft keys to invoke a context menu where it's possible. The address book can store up to 200 entries, each containing 3 phone numbers, a fax number and an e-mail address. You can also supply an entry with a picture or a photo that will be shown on display during that person's call. 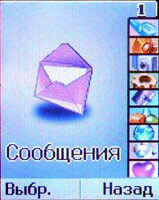 The phone book menu opens with the right soft key. But there is no hot key for seeing the list of entries as the "down" joystick normally used for this is programmed to show the list of frequently used commands. Entries can be stored in seven groups which you can rename to your convenience. The model also enables voice dialing. 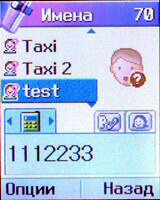 Entries from the phone memory and the SIM-card are shown in a single list. In short, the address book is absolutely typical of a Corean handset. The Messages menu includes various options for SMS and MMS messages which are almost completely unified today. 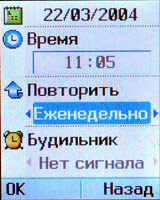 The Calls menu contains lists of missed, incoming and outcoming calls. A GPRS traffic meter is also fitted in here. The Profiles menu enables to set all phone signals. Typical for most LG models, a call melody can only be set in Profiles and nowhere else. Camera contains options for handling the built-in camera. We shall examine this menu in details. First of all, shooting function can be invoked using either the menu or a special key on the right side of the phone. Both ways open a dialogue menu where shooting option is first and selected by default. Then you press OK to open a viewfinder window. But the problem is that the objective is fixed on the left of the hinge, so when shooting you have to hold the handset in an unusual way and pressing the left soft button (serving for confirmation) becomes rather inconvenient. Photos can be taken at up to 640x480 pixels, shooting options include an automatic frame application and a serial shooting. The viewfinder window enables to set contrast, make digital zooming and rotate shots. When shooting, the customer is presumed to hold the phone sideways and turn the display toward himself so that the latter will be at about 90° to the base unit. With the hinge capable of turning to any angle, customers mostly use it to the maximum opening fully the upper part. But hidden shooting in this position is virtually impossible as it can't go unnoticed by people around. Perhaps this was done on purpose; perhaps manufacturers wanted to increase their export to the countries that prohibit use of hidden-recording devices. But the thing is that this position of the handset makes it very difficult to use the viewfinder for figuring out camera tilt from the horizontal axis. Thus, a novice will hardly be able to "catch the vertical" in the shot, so he would do with a bit of advice. He should remember that the camera is positioned vertically in the phone, so a strictly vertical position of the base unit will enable to get a well-oriented shot. Or he should keep the shot's vertical lines parallel to the viewfinder's long sides (or perpendicular to the horizontal ones). It is more convenient, though, to hold the phone open at 90°. But then again, this position only allows to take landscape-oriented pictures (portrait-oriented ones can be taken by placing the phone horizontally) and the overweighting cover hampers shooting. So, camera use is probably the softest spot of the G7120 ergonomics. The Settings menu deals with the phone parameters and also  traditionally gor LG  includes alarm and divert options. With regard to the alarm, you can set up to five different signals making each of them either momentous or recurrent (Monday-Friday, Monday-Saturday, daily). Such range of options seems to be more than enough even for the most discriminative customers. The Organizer contains a calendar and a command for an alternative access to the phone book. 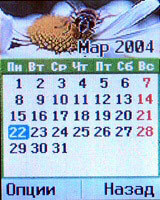 The calendar only supports a monthly mode  which is highly popular with common people but not always convenient for businessmen. When setting a reminder, you can choose one of the following repetition modes: momentous, daily, weekly, monthly, and yearly. Such range of options is normally enough for an average customer. 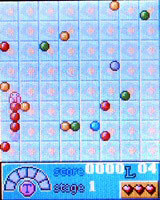 Accessories comprise games and a number of minor business utilities. There are three quite interesting games here that are new for LG phones. 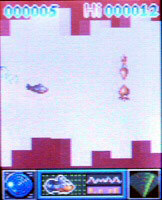 They are Multiply (a kind of Tetris), Spaceball (a modified version of Snake), and Submarine (a scrolling arcade). The menu also includes a calculator, a media-browser, a musical editor, a converter, a list of time belts, an IR-port, and a dictating machine. The latter, however, can't record a phone call, serving only for voice memos. The Internet menu contains a WAP-browser, quite expectedly. Java constitutes a separate item of the main menu. Apart from standard devices for midlet loading and control, it contains a full description of memory contents suggestive of its dynamic distribution. A total memory size is about 1 MB. Folders "Incoming" and "Outcoming" and MMS patterns occupy 100 kB. The rest of the memory is distributed between images, melodies, recorded excerpts, and Java-applets. In general, the distribution seems reasonable, but the total memory size is too small for serious operations. It is only suitable for entertainment purposes and short-term information storage. The Selected menu can be used for storing 9 most frequent commands to ensure a quick access to them. This menu also opens with the joystick pressed down. In respect of the connection quality, no "deviations from the norm" were found. The speaker is loud enough in any condition, and the volume can be changed with side buttons during a call, which is very convenient. G7120 has loud and high-quality 40-tone polyphony. If an appropriate melody is chosen, you will hear your phone ringing no matter where. Vibrocall is good enough, but we can't say it's really really strong. When fully recharged, the battery works for three days providing an average amount of talking. Such run-down time is good for a clamshell phone. LG G7120 main rivals are top-class clamshells of other companies, such as Motorola v500/v600, Nokia 7200, Panasonic X70, Samsung SGH-E700, and Sony Ericsson Z600. With Motorola, Panasonic, and Sony Ericsson phones belonging to the "business-image" class, the only immediate rivals left are Nokia and Samsung. Both handsets have quality displays (especially Samsung E700) and a better functionality(first of all, concerning memory size). All the three designs are similar in quality but altogether different in style. So that will probably be the main criterion for the choice of a phone. We guess that LG G7120 main target-group is young purchasers of expensive image phones that will be attracted by the phone's high-quality futuristic design. But this a rather thin segment of the market. With a skillful advertising campaign, LG G7120 can be made into a sucessful fashionable handset catering to those who seek to try all new image phones just because of fashion. The LG brand is not yet so popular with elite customers as Nokia or Samsung, so they will hardly use this model for a long time. But we think that elite customers can at least use it for some time, as was the case with LG-510w and G7100. The history can repeat itself with G7120 too. Write a comment below. No registration needed! Comparing old, cheap solutions from AMD with new, budget offerings from Intel. A couple of mid-range adapters with original cooling systems. An external X-Fi solution in tests. The first worthwhile Piledriver CPU. Trying out the new method. Retested all graphics cards with the new drivers. Added new benchmarks: BioShock Infinite and Metro: Last Light. Added the test results of NVIDIA GeForce GTX 760 and AMD Radeon HD 7730. An excellent hybrid of GeForce GTX 650 Ti and GeForce GTX 660. Added the test results of NVIDIA GeForce GTX 770/780. Copyright © Byrds Research & Publishing, Ltd., 1997–2011. All rights reserved.